Controversies have surrounded the rock from Greenland (lower right), and the significance of graphite (red) with apatite (turquoise) in such rocks, for the past 20+ years. Note the coarse-grain size of both highly metamorphosed banded iron formations. The thin sections (bottom) are paper-thin slices of the rock. Credit: Dominic Papineau Ph.D. The research, published in two papers—one in the Journal of the Geological Society and another in Earth and Planetary Science Letters—solves the longstanding problem of how scientists can track records of life on Earth in highly metamorphosed rocks more than 3,700 million years old, with organic material often turning into the carbon-based mineral graphite. They argue that carbon preserved in graphite-like crystals -'graphitic carbon'- located alongside minerals such as apatite, which our teeth and bones are made of, and carbonate, are the biosignatures of the oldest life forms on Earth. "Life on Earth is all carbon-based and over time, it decomposes into different substances, such as carbonate, apatite and oil. These become trapped in layers of sedimentary rock and eventually the oil becomes graphite during subsequent metamorphism in the crust," explained Dr. Dominic Papineau (UCL Earth Sciences, Center for Planetary Sciences and the London Centre for Nanotechnology). "Our discovery is important as it is hotly debated whether the association of graphite with apatite is indicative of a biological origin of the carbon found in ancient rocks. We now have multiple strands of evidence that these mineral associations are biological in banded iron formations. This has huge implications for how we determine the origin of carbon in samples of extra-terrestrial rocks returned from elsewhere in the Solar System." Example of sub-microscopic graphite (red) with carbonate (green) and magnetite (yellow) inside a crystal of apatite (turquoise) in a 3.7 to 4.2 Byr old BIF from Canada. Credit: Matthew S. Dodd Ph.D.
"Previously, it was assumed that finding apatite and graphite together in ancient rocks was a rare occurrence but this study shows that it is commonplace in BIF across a range of rock metamorphic grades," said team member Dr. Matthew Dodd (UCL Earth Sciences and the London Centre for Nanotechnology). "Our new data provide additional lines of evidence that graphite associated with apatite in BIF is most likely biological in origin. Moreover, by taking a range of observations from throughout the geological record, we resolve a long-standing controversy regarding the origin of isotopically light graphitic carbon with apatite in the oldest BIF," said Dr. Papineau. 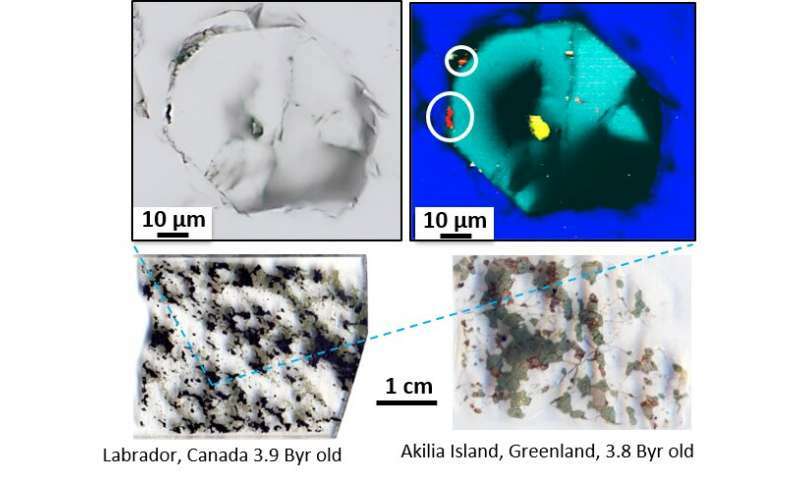 "We've shown that biosignatures exist in highly metamorphosed iron formations from Greenland and northeastern Canada which are more than 3,850 million years old and date from the beginning of the sedimentary rock record."